Description: Nationally known pastor, Bill Winston brings this powerful message of God's provision, healing, and more that is already resident in the believer and available to those who will seek God's direction. If the Kingdom of God is in us, why aren't we living lives of greatness in our world? 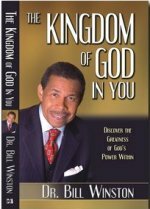 Bill Winston recognizes that there are two kingdoms at work in this world, and tragically, even within the church, the majority of people are still living under the destructive lies and patterns of Satan's rule. They don't have the power and provisions of God's wisdom, understanding, peace, joy, health, abundant material provision, life-changing ministry, and so much more?because they simply have not recognized the kingdom in them. The promises of God rarely come from some outside sovereign work of God, but from the kingdom already inside. The pastor of one of America's fastest growing churches, Winston helps believers to start walking their faith out in miraculous ways. Why? We have a power within us that is supernatural and flies in the face of the world's arrogant, but ultimately inadequate, self-reliance on human understanding and effort. With the faith of a child, even as small as a mustard seed, we unleash God's provision and power in our lives not by focusing on what we want, but by asking what the King of the Kingdom, God Almighty, wants us to accomplish. We quickly discover that our grand dreams and aspirations are minuscule in light of the greatness He has in store for us to do. This book is not for Christians who are complacent and desire the status quo. This is a soul-changing book that will turn the timid into the bold, and result in miracles that will build God's Kingdom right here and right now.